Google is planning to move all FeedBurner accounts to Google Accounts by February 28, 2009. If you are eager to transfer your Feedburner Account to Google, then you can do this now. 2. Login using your Google Account ID. 3. Then you will see a box as shown. Enter your Feedburner Username and Password in the box. 4. Click Next button and the moving of Feeds will start. 5. Success! You have moved your Feedburner feeds successfully to your Google account. New Feature Introduced: MyBrand lets you use your own domain name to host your feed. All publishers with an AdSense account will be able to participate in AdSense for feeds, to help make money from the valuable audience. There are two features that are retiring from all versions of feedburner: Site Stats (visitors) and FeedBurner Networks. Now your old FeedBurner feeds (feeds.feedburner.com) will automatically redirect traffic to their new address on the feeds2.feedburner.com domain. You must update any links or buttons on your website to use the new feeds2.feedburner.com address. 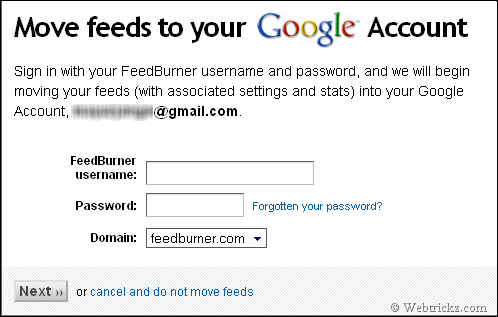 >> Please visit Transferring FeedBurner Accounts to Google Accounts FAQ for more details. If you are having problems in viewing our feeds, then please update to the new feed address.